While implementing Business Process flows for our customers, how I wished for if Microsoft had provided Client API’s to deal with the Business Process Stages. 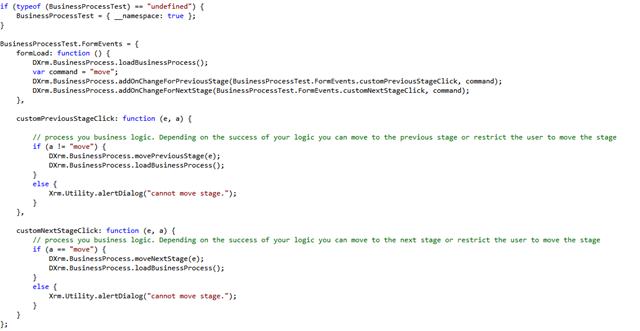 How easily I could have implemented some of the requirements that customers asked me regarding Business Process flows. I am sure that many of you have wished if we could control the next and previous stage movements but sadly even with 2013 SP1 release, there is no client API provided. Although Microsoft is coming up with very efficient client API to deal with business process flows, but my customers has recently upgraded to 2013 and they don’t want to shift to 2015 now. Register you own custom event handlers when Next Stage and Previous stage is clicked in the business process flow. And whole lot of other functionalities! Please note: This tool utilizes jQuery to achieve its functionalities. However their is no major manipulation of DOM elements done by this tool as such. So you can try it out safely for your organizations. I have tested this tool with CRM 2013 SP1 version and it works fine. Next Post Understanding how SLA’s work in CRM 2013. Effects of change in SLA details or deactivation of SLA on a case. If you want to test it, please contact me for a demo.